Moodolph | CowParade New Figurines | One Price Low Flat Shipping! 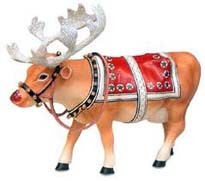 From the CowParade Holiday Collection, Moodolph. Designed by artist, Mariquita Masterson and Family. Featured at the CowParade Houston 2001 exhibit. Made of resin. Measures 4" x 6"
This fun cow is costumed to look like Rudolph the Red nosed Reindeer, complete with a jingle bells strewn harness and red coat! The cow has glittered antlers, along with red shiny glitter on the cow's nose. Great holiday collectible cow figurine!